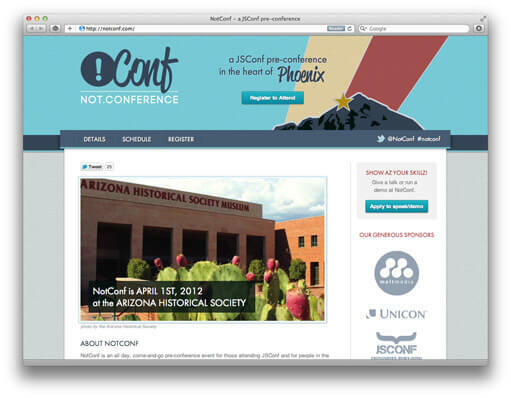 NotConf is an all-day event on April 1st featuring speakers, intimate demos, live music, local Arizona brewed beers and food trucks, and plenty of time to socialize with other JS geeks. It will be held at the Arizona Historical Society at Papago Park, a venue perfect for showcasing the beautiful Phoenix landscape and weather. NotConf is calling for speakers, demos, and volunteers. Register to attend or just check out the responsive website created in a few short days by the Meltmedia team.